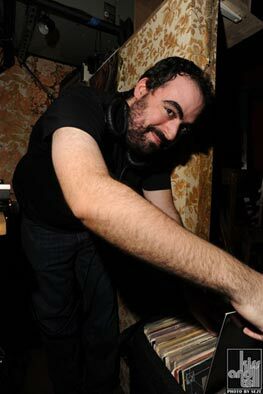 Dan Selzer is an eclectic DJ with a wide range of influences. Growing up a new wave teenager in the New Jersey suburbs, Dan couldn't help but be exposed to his sister's punk records, the club music blasting out of cars or the oldies playing on the radio. After mastering the art of the mix-tape, Dan grew to find that DJing was the best way to share his love of music, make other people happy and have a great time. Influenced by early 80s NY, when punk and disco, new wave and hip-hop, funk and rock all co-existed on the dancefloor, Dan began DJing loft parties in Brooklyn. He started his first weekly party, Transmission, in 2000 at Plant Bar with members of the band The Rapture. During its 3 year run, it was mentioned twice in the Village Voice's "Best of NY" issues and recommended by Spin Magazine. His next residency, Alldisco, first held at SubTonic, then Capones in Williamsburg, helped pioneer the disco revival in NY and got positive notice from i-D magazine. Dan's current residency is the music-nerd's favorite record listening party, Dazzle Ships. Under the name Crazy Rhythms, Dan used to DJ with Mike Simonetti of Italians Do It Better. In 2005, a Crazy Rhythms mix CD came out on the label RVNG and quickly sold out. While not DJing, Dan runs the post-punk reissue label Acute Records, hosts the internet radio show Pyjamarama on Viva-Radio.com and occasionally appears on WNYU and WFMU. His passion for music has also found an outlet as music supervisor for the No Wave cinema documentary Blank City, contributing research for the MoMA exhibit Looking at Music: Side 2, and writing on music for various websites and magazines. While all these outlets provide means for Dan to explore different kinds of music, he is most excited to be able to DJ to a live crowd and play the records that get them dancing, and whether it's a late night party at an illegal outer-borough loft, a trendy meatpacking district club, an elaborate wedding or a sweaty house party, Dan's just happy to be playing music. Dan has DJ'd all over NYC at venues such as APT, Santos Party House, Le Poisson Rouge, The Ides at Wythe Hotel, Studio B, Tandem, Tribecca Grand, Le Bain at the Standard, Centro-Fly, Hiro Ballroom, Trophy Bar, Submercer, Union Pool, Spa, Shine, Spirit, Boogaloo, Happy Birthday Hideout, Rubulad, Mighty Robot, Capones, Happy Ending, Luxx, Knitting Factory, Baktun, Filter 14, Luke & Leroys, Lit, Pianos, Legion, Hotel Delmano, Subtonic, Nublu, Secret Project Robot, Mannahatta, Bar 13, Don Hills, Heathers, The Boys Room and Plant Bar. He has also DJ'd in Montreal, San Francisco, Los Angeles, DC, Detroit, Philadelphia and London. Dan has appeared on bills with DJs such as Morgan Geist and Darshan Jesrani of Metro Area, John Selway, Pal Joey, James Murphy, Mike Simonetti, Rub-n-Tug, Jaques Renault, Optimo, Rory Phillips, Prince Language, Lee Douglas, Z-Trip, Steinski, Afrikaa Baambata, Danny Wang, Stretch Armstrong, Tim Sweeney, Bumrocks, Lovefingers, Beppe Loda, Peter Hook, DJ iDeath, Tommie Sunshine, Speculator, Duane Harriott, Brennan Green and many others. Sign up for the Dan Selzer DJ events mailing list here!